Process checks at the point-of-sale using TeleChecks proprietary risk management tools to minimize returned checks and offer consumers their payment method of choice. With the verification solution offered by 1st Advantage Merchant Service New Jersey, you and your workers can make clear and concise decisions on whether a check is worth accepting. Our technology utilizes a risk scoring system so merchants can decide in seconds if they should accept the check. The rejection of processing high-risk checks on the spot minimizes the expense and hassle of attempting to collect later. Merchants can also select the warranty service for even greater peace of mind. 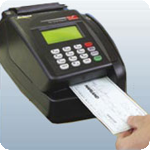 With the warranty service, TeleCheck will manage the check collection process.